I would think it's a privacy thing, though they certainly earned a party! Trying to enjoy some free time while living in a fish bowl would not be fun. 10 astronauts trying to eat a meal on the shuttle's mid-deck? They must be crazy! Thanks! Thought that was weird. I need to wash my ears out! "We need to do a better job (on publicity of what the ISS does). "The station is enormous, it's got as much space inside as a jumbo jet. You can lose people, that's how big this place is. It is ready to be utilized (six person crew). 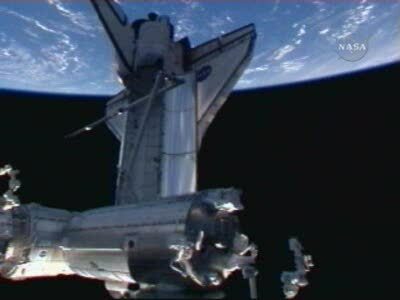 It's extreemly busy, action packed, it's about operating this enormous space station. It's really impressive we've pulled it off. "You can also be a superhero" (shoots up into JLP). Good interview by NBC. He even ends it with God Speed. Garrett's advice to Greg is "just hold on tight." Both doing a very good job in making sure they note lots of work is going on with the ISS. Asks about Greg's role in developing some of the ISS proceedures. Apparently he worked on the display we see lots of on NASA TV when they are out of KU! Garrett on what it's like during the days on the ISS, given it's different to days on earth with the orbital sunrises etc. Asking about Greg's Jewish roots. He's brought some bagels on board with him. He's took some other items up (cS Robert might know) which he can't install or decorate on the ISS, as that's not allowed. Fox News Radio (Holly Hickman! ) Looks like it is live too. Asks about Garrett's experience and what's changed him. "When I first looked at Earth out of the window, it was similar to what I had seen from high altitude planes. It wasn't an emotional experience. Ask about Kibo/ISS being a giant lab and the transition from Gemini, to ISS, to the moon etc. "The station plays an important role. From an engineering point of view it's unprecidented. All these complicated modules, built in different countries, all linked up in space. It's also political, a massive effort in peace time. "We're also learning how to stay healthy for long times in space. (speaks on relation to when someone arrives on Mars." (Paraphrasing as this is fast moving). Holly asks Garrett about how ISS inspiration for kids, to be inspired to get into science/engineering, rather than gangs. (Garrett's sister is involved with such youth projects). "This is a model for the future, to give hope to the kids out there. "This is an amazing facility up here. You can see the shuttle and the arrays from a Russian module, and you can see it's really a massive facility, with four docking ports, visiting spacecraft, moving fast across the sky. The purpose of these modules is to do experienced. Material science, to biology, to Earth observations etc. "Experiments we do here will help (applications) on Earth." "But the purpose here to to learn how to explore." Good event!! Most of the transcribing was paraphrased. PAO Event concluded! Great job on the transcription, Chris. And a quick backflip before things get serious.